Since 1983, Graber’s Well Drilling, Inc. has been the premier provider for quality well and pump services throughout the LaGrange County, IN region. Founded on the principle of good customer service, we’ve held fast to this commitment for three generations. Family owned and locally operated, Graber’s Well Drilling, Inc. takes pride in every job we do. Our friendly staff works with each of our customers to ensure that their exact specifications are met. We are committed to meeting project expectations and providing continuous service throughout the completion of every job. This dedication to performance excellence has made Graber’s Well Drilling, Inc. the trusted provider for well drilling in LaGrange County, IN. Our customers know they can count on our extensive knowledge, industry-leading techniques and 30 years of experience to meet all their water well system needs. Our services include new water well drilling, repairs, maintenance and cleaning, pump replacement, water pump repairs and maintenance to maintain constant water pressure, bladder tank installation and replacement, well water testing and chlorinating wells to prevent bacterial growth. We are locally owned and operated, established in 1983. We are an Accredited Business with an A+ Better Business Bureau rating. Our highly trained technicians offer expertise in both residential and commercial settings. 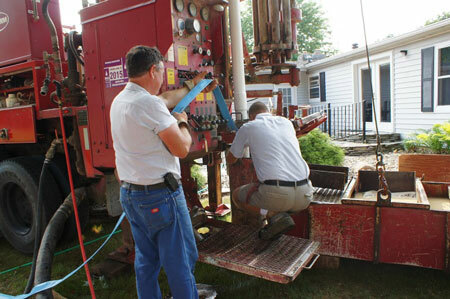 We are fully licensed and insured, and a Michigan Registered Water Well Drilling and Pump Installation Contractor. We offer a personal consultation and free, guaranteed price quote. Schedule a free consultation today to ensure all your well drilling and service needs are met tomorrow. August 9, 2018 Jennifer T.
"Had to call Grabers Well Drilling out this morning because our pump went out and left us with no water. They told us they would come out as ..."
September 19, 2017 Amanda B. "Reasonably priced for a new well. They work in a very timely manner and are very friendly. I would recommend them to anyone in need of a new..."
September 11, 2017 Heidi E.
"After waking up to a "dry" household unexpectedly this morning, these guys came promptly & repaired our pump in less than an hour. They were..."
"These folks really helped me out with a new well when I was in a real pinch." November 7, 2016 John S.
"I highly recommend the service provided by this business. Our well was leaking and creating a puddle of water beside the pipe. Steve worked ..."